Have you ever dreamed of celebrating a milestone birthday, an anniversary, or an event that’s special to your family in a place as beautiful as it is luxurious? 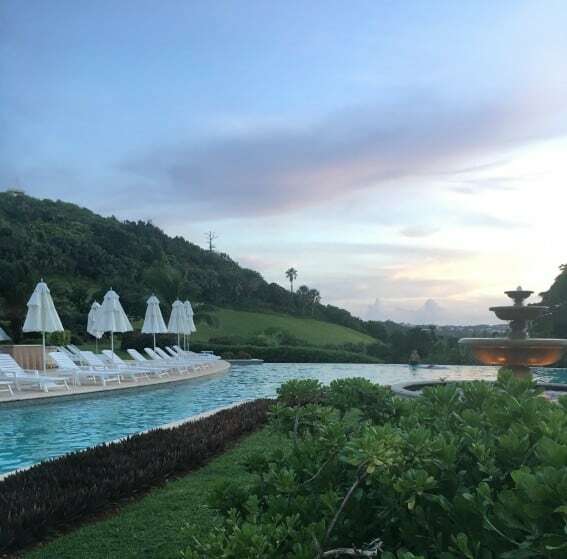 Rosewood Tucker’s Point on the island of Bermuda delivers when it comes time to treat your family to something really special. If the beautiful views, the pretty landscaping, or the exquisite sense of relaxed but refined seaside style don’t amaze you, the genuine friendliness of the staff will most certainly win you over. Combine this with the delicious, upscale dining options and the vast array of family-friendly activities and this resort will have you wondering why you ever stayed anywhere else. The staff at Rosewood will go to great lengths to make your stay here special and one you’ll treasure. You’ll feel taken care of, your palate will be satisfied, and you and your kiddos will have ample opportunities to relax or keep busy here. Look into this exquisite resort for a stay that will resonate with your family well after you leave, and may just be the most scenic and rewarding place they’ve ever been to. Getting to Rosewood Tucker’s Point is as easy as it is rewarding once you get to the island. In addition to being about 90 minutes from many east cost U.S. cities, it’s also close to the only airport, L.F. Wade International, so you don’t waste valuable vacation time in the car. Non-residents of the island cannot rent cars, so take your pick from taking a shuttle, hopping on a public bus, or grabbing a taxi. When my family visited, we found it easiest to get a taxi to the resort, although we saw folks successfully using many of the other modes of transport. When you approach the resort, you’re able to feel yourself start to relax as the lush, manicured, well-maintained grounds come in to view. 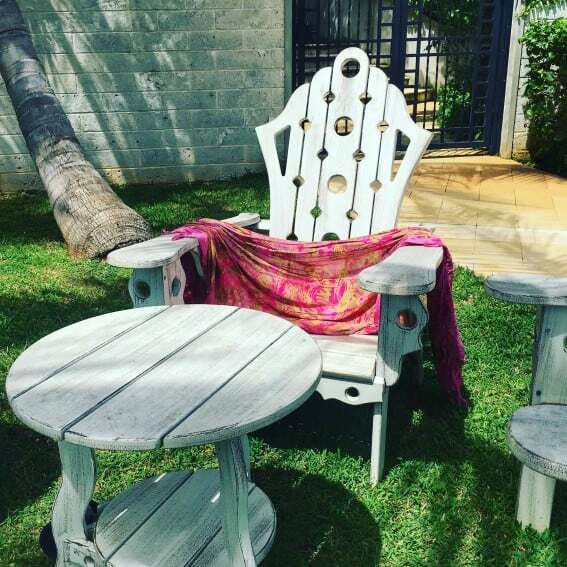 Rosewood is perched above picturesque Castle Harbor with what locals report to be the best private beach on the island, and many visitors to the resort don’t find the need to leave here once they’ve arrived. The staff is tremendously friendly, and makes it a point to treat your individual needs, whether big or small, with respect. They call you by name when they can, and they’ll ask about your day when you head out or come back to the resort, which is a nice touch. Rosewood Tucker’s Point is well known for their spectacular private beach, their elegant and delicious dining options at their four acclaimed restaurants, their challenging golf course, and their 12,000-square-foot pampering spa. No matter what reason you’ve come for, you’ll appreciate the big things as well as the little things that make this place great. The property is quite large, but shuttles are available to take you around at regular intervals, which makes getting from one place to another very easy. Little ones can have fun on their own or as part of the Rosebuds Kid’s Club. Here, children play at the nearby private beach, do crafts, play games, and even learn about the nearby reefs and fish. Rosebuds is a perfect way for kids to enjoy the company of other youngsters, and for parents to get some time to themselves. 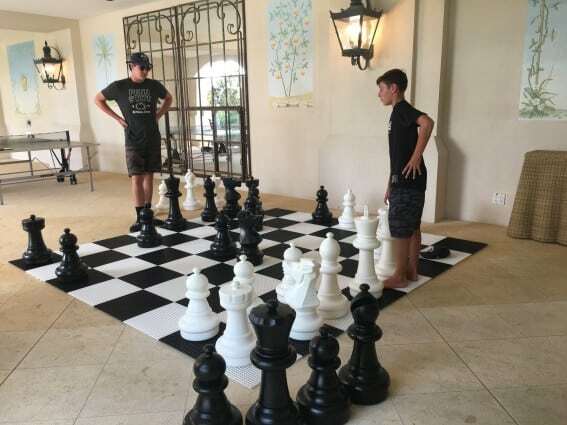 Older children vacationing at the resort will appreciate the on-site water sports, the tennis courts, the three beautiful pools, lawn games, life-sized chess, ping pong, big Jenga, and other fun games that are easily available as a quick pick-up activity. There is a fitness center, classes, and an onsite path to walk along, too. Should you want to partake in something you don’t see, ask a staff member and they’ve probably got information on how to do just that. There’s also good, free WiFi, which all kids love! One of the little things that I found especially valuable was the fact that hey had sunscreen readily available at every pool. Should you forget yours, bring too little, run out – there it is ready to go to protect your crew from an uncomfortable sunburn or two. Cold lemon water is also available for self serve by the pools, so you’re never parched in the sun. My kids liked that when the staff welcomed you to the beach area or back to the main entrance after venturing out, they chatted with them a little bit. It was fun to watch them laugh and remember the staff since they’d talked and joked with them. They weren’t just workers at the resort, they were friendly people who took the time to converse with them and comment on things they could relate to, making it a much more personal experience. 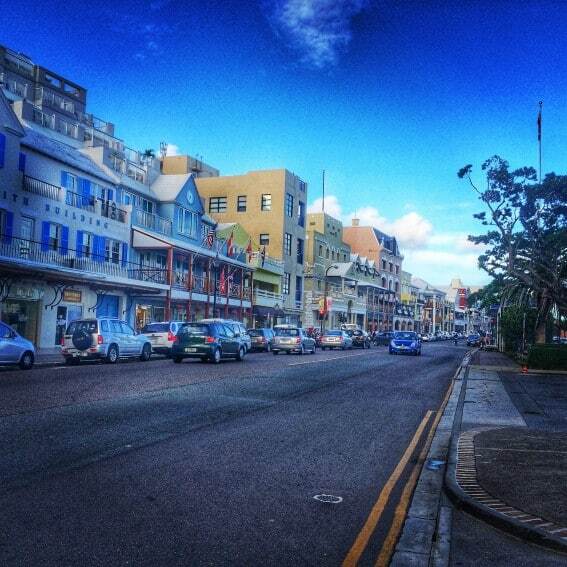 Heading to some of Bermuda’s family-friendly points of interest around the island is no problem should you decide to explore the area a bit. Many folks head to the nearby town of Hamilton to shop, eat, or wander about. Should you need or want something, simply feel like browsing the shops, or want to get a change of scenery, be sure to venture to this cute little town. Other folks like to head to St. George’s to explore a bit. Get to either of these towns by taxi, local bus, scooter, island ferry ride, or a combination of these. Further away on the island, you can also explore at the port where cruise ships come in. Things like jet ski tours are available here, there are shops to get a great gift in, seasonal activities, a fun mini golf course, and other entertainment is available in the area. Bermuda as a whole is not very big, so you’ll easily be able to get from one end to the other or anywhere in between should you decide an activity is worth taking part in. There are also several things to do nearby resort such as the interesting Crystal Caves, so be sure to look at a local map to see if any of them would be of interest to your group. Depending on your family size and your preferences, there are room options to accommodate your needs here. Stay in a room, stay in a suite, or settle into a villa. No matter what you choose, there’s enough room for all of you to feel comfortable. While we were visiting, we saw folks with infants, toddlers, preschoolers, and teens. These folks could get adjoining rooms, or book a suite or villa with the layout to best accommodate their family. 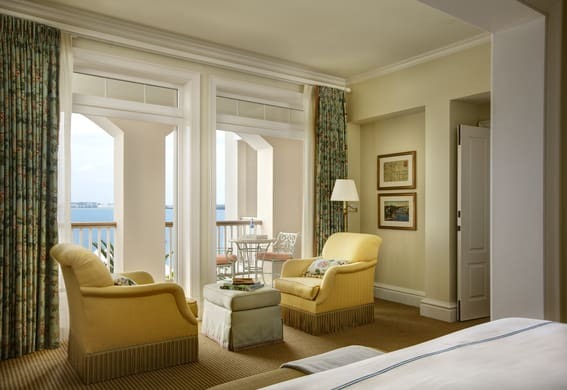 Each room is airy, elegant, and the views of the harbor from the rooms here are stunning. They’ll make you not want to leave your balcony. The resort staff has made it a point to think of everything you’ll need in your room. The king and queen-sized beds are very comfortable with soft sheets and fluffy pillows galore. You’ll appreciate the soft, elegant, seaside decor and be able to refresh yourself in the large, pampering, upscale bathrooms complete with standalone bathtub and luxurious toiletries. There’s counter space too, which is always a bonus when traveling with kids. You’ll also be able to sit somewhere other than the bed while in the room, as they offer additional comfy chair seating, as well as balcony space to sit, work or read. There is a well-stocked mini bar in the room, and see spaces come equipped with wet bars and private fireplaces. Pretty artwork and decor, as well as plenty of light coming in from the windows, lets you enjoy the sunshine a bit longer should you desire – and who wouldn’t want to savor just a little bit more of that? While a stay at Rosewood Tucker’s Point is a treat, and certainly not budget-friendly, it is one of those places that stands out for really special occasions where you want something distinctive. The pretty pictures you’ll take on the beach and around the grounds here are sure to be ones that will stay with you forever. You won’t believe there are places this gorgeous to enjoy. Wander down to the beach with your camera at all times of the day to get surf and shore pictures that are frame-worthy. You can also hire someone to take professional shots of your group should you choose to do that as well. The possibilities are endless at a resort designed to make you feel like the most special family on the island. Be sure to check for seasonal promotions and offers for packages that will make a stay here perfect for you. *Disclosure: My family and I were hosted at Rosewood Tucker’s Point in order to facilitate this review. The opinions stated herein, however, are entirely my own.